Depending what part of an Uncharted game you see him in, Nathan Drake is either a wisecracking dude clinging to a cliff face or a cold-blooded murder machine. Players have to do a fair amount of mental gymnastics to believe that this is the same guy in both instances. Uncharted 4 makes that cognitive exercise a little bit easier. When I finished Uncharted 4 on Tuesday night, I was struck by how the game seems designed to tackle one of the biggest criticisms lobbed at Nathan Drake. When the term “ludonarrative dissonance” (wait, come back!) was being thrown around hot and heavy, Nathan Drake’s name popped up a lot. Commentators would point out the yawning chasm between the way the character was written and how the game’s gunplay mechanics made him feel. He’d veer from a semi-sympathetic rogue to a stone-hearted killer in a heartbeat. (Naughty Dog even snarkily named one of the trophies in this new game after the term.) The Uncharted titles are games you play for character and story. You’re supposed to want to have a beer with the guy, but it’s tough to get into that headspace after having him singlehandedly slaughter a small army. When Uncharted 4 starts, Nathan has seemingly left all that behind. A funny early sequence where he shoots paper targets with a toy gun is a reminder of the fractures that separate the various parts of his life. The quiet married routine he’s living in at the game’s start doesn’t quite come across as closure or reconciliation; it feels like resignation. The reappearance of his long-lost older brother Sam pulls Nathan back into those familiar divides again. Dissonance turns out to be a major theme in Uncharted 4, and the game concerns itself with the gap between how you present yourself to the world and the things you hide from people around you. As the globe-hopping gets under way, Nate lies to his wife, Elena, about what he’s doing. That moment stretches the divide between the parts of the hero’s life to an impassible degree. How’s he going to jump back onto the living room couch after that whopper of a lie? No amount of snappy patter is going to help, and he can’t shoot his wife. For much of the game, this tension looks like an environmental puzzle with no solution. One of the game’s flashback sequences opens a window of cautionary foreshadowing. In Chapter 16, young Sam and young Nate break into a home that supposedly houses mementoes of their dead mom. As they look for their mother’s old notebooks, the pair stumble across correspondence and ephemera that slowly reveal the story of another family. Kenichiro Namba struck up a romance with an explorer we only know as Evelyn, eventually marrying her and raising a son named Edmund while she chased archeological finds all over the world. The letters and set dressing inside the moribund home tell a sad story of divorce, lingering illness and filial estrangement. The grown-up Edmund’s final letter to Evelyn seethes with resentment at how she couldn’t integrate the various elements of her life into a cohesive whole. Evelyn’s encounter with the two Drakes points the boys at their future in more ways than one. It’s then that they decide to follow in their mother’s footsteps and look for history’s great mysteries. Evelyn’s lonely death is what awaits Nathan if he continues making the same mistakes she did. If he can’t stop putting adventure before everything else and integrate the disparate parts that make up his self, odds are high that he’ll die alone, too. The subtext of the Evelyn chapter supercharges Nate’s reunion with Elena. As a boy, he was arguably too young to heed the warning embedded in her sad final days. As a man, he seems to be just too clueless to realize that Evelyn was his thematic forebear. The dissonance now comes from his frantic efforts to save his brother’s life and where that course of action will leave with him with his wife. 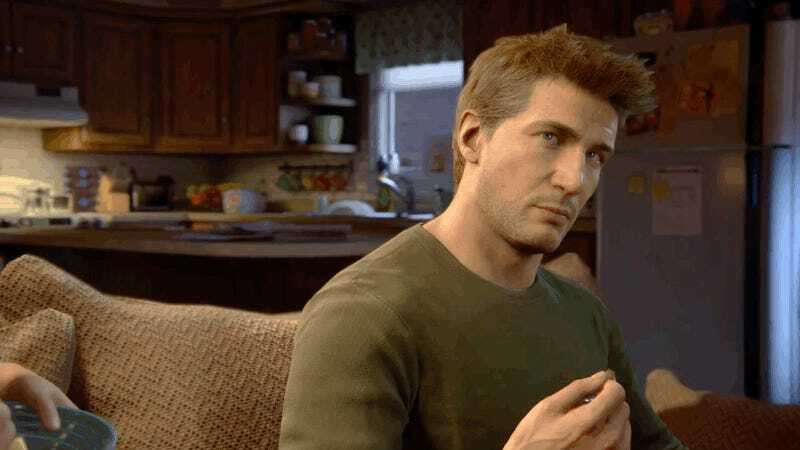 Even as Nate tries to banter his way back into Elena’s heart, there’s this look in her eyes—thanks to some truly wonderful animation by the folks at Naughty Dog—that says she knows something about him that he’s not saying. What Nate isn’t voicing is shame. There’s a part of him that needs to be the rope-swinging, neck-snapping adventurer, but he can’t admit it. The life-or-death threat hanging over Sam’s head provides a convenient excuse, but Elena’s face says that she’s not buying it. Later, it becomes clear: the shame Nate feels isn’t because he’s left his old life behind. It bubbles up because he never should have left it in the first place. The tension at the heart of the Uncharted games has come from the ambition to map out the interior life of a glib everyman adventurer while pinned down by action game design that demands a high body count. Sam, too, evinces a more transparent version of the same dissonance, as demonstrated by the scene where he shouts that rich-boy villain Rafe doesn’t deserve the legendary treasure they’ve all been hunting. His anger comes from the fact that he needs to be something more than an ex-con who had 15 years of his life evaporate into nothing. Sam hungers for glory more than gold because he too has psychological gaps to jump. The final fight between Rafe and Nate at the end is up-close and personal, filled with acidic trash talk claiming that Nate doesn’t live up to his legendary reputation. Rafe rants about having had everything handed to him by wealthy parents, making it clear that he also has a shame-laden sense of self hanging in the balance. The tension at the heart of the Uncharted games has come from the ambition to map out the interior life of a glib everyman adventurer while pinned down by action game design that demands a high body count. That push-and-pull made players and critics interrogate the series’ main character and design execution. 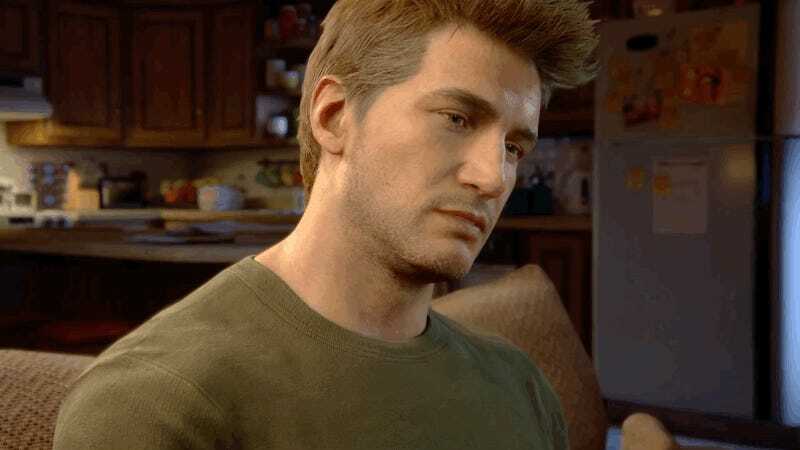 Naughty Dog created a character that they wanted to make three-dimensional but had to deliver him in a game that would become a tentpole franchise for Sony. However, Uncharted 4 doesn’t feel like it wants for any kind of explanation. The game harbors a brutal honesty about the space between self-image and reality. Nathan Drake is not just a euphemistically nomenclatured ‘treasure hunter’ in this installment. He is, in his own words, a thief. The moments I’ve talked about above make it feel like the main thrust of this game is acknowledging the gap between action and consideration. All the dissonances that precede Uncharted 4’s ending help to make it so masterful. Nathan’s left a life of violence and questionable morality behind to scour the world for adventure with his wife alongside him. During a sequence that’s all discovery and no combat, Nathan’s daughter Cassie finds her dad’s dangerous past locked away. Nathan doesn’t try to lie or smooth-talk his way out of telling her the truth. As he starts walking Cassie through the improbable peaks and valleys of his existence, it becomes clear that Nathan Drake’s life doesn’t have any more dissonance or gaps to jump. His pieces fit together. He can say goodbye.